How to choose the right top for your dining table? At the end of a hard day’s work we sit down at the dining table. During weekends or at special occasions we invite our dear friends to join in. Surrounded by those who matter most to us we not only taste food but savour the delicious moments of life. Luciano Pavarotti, one of world’s most successful tenor believed, “One of the very nicest things about life is the way we must regularly stop whatever it is we are doing and devote our attention to eating.” We share his views when we speak of eating as a daily ritual and not a simple way of sustaining one’s life. It is not surprising then, that next to our living room we worry most about how we should decorate our dining space, especially at this time of the year when we tend to invite many guests over dinner to mark the beginning of the holiday season. Our dining table holds the focal position here so it matters a great deal to us that we select the right kind of table for this space and also set it in the right way. But how do we choose the ideal dining table for our home? Here is our recipe for it. A glass top dining table instantly gives your dining room a sophisticated makeover. Decking it up with a simple vase of flowers is enough to create a powerful impression. 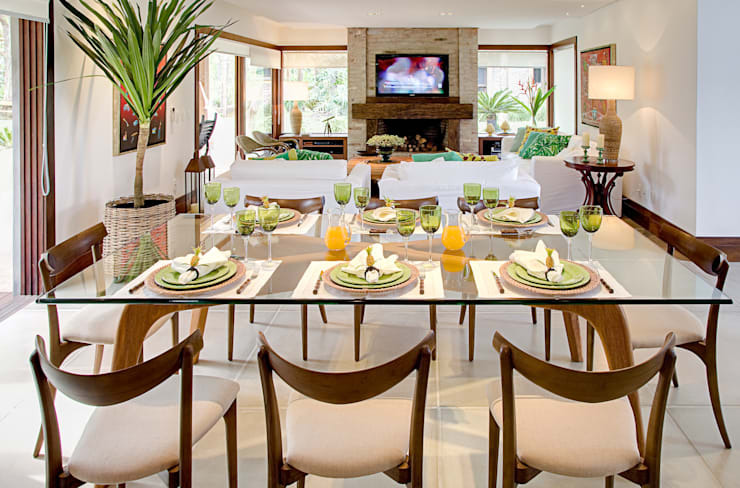 See how beautifully Maria Christina Rinaldi Arquitetos decorates this dining space with a glass top table. Glass top tables are however difficult to maintain. Dust and dirt tend to cling to it. You will have to wipe it clean every now and then to keep it free of finger prints. It also tends to showcase scratches prominently, particularly when used over a period of time. Compared to wood, the design choices are also limited. You may not perceive this under normal circumstances, but a lot depends on the shape of your dining table. For a cosy family dinner or breakfast a round table looks classy. Everyone also has an advantage of seeing each other’s faces over a hearty meal. But this is not so ideal a choice for dining with a larger group of people. For a formal setting you need at least two feet of space between two subsequent chairs to avoid elbow clashes. Your round table will have to be unusually large to accommodate everyone in such a case. For this reason and also also apartments with space constrains rectangular shapes work best. If your heart is set on having a roundish table top though, choose an oval one instead. Depending on the décor of the room and material of the table irregular shapes may also work out. Wood is by far the most popular material for dining table tops. 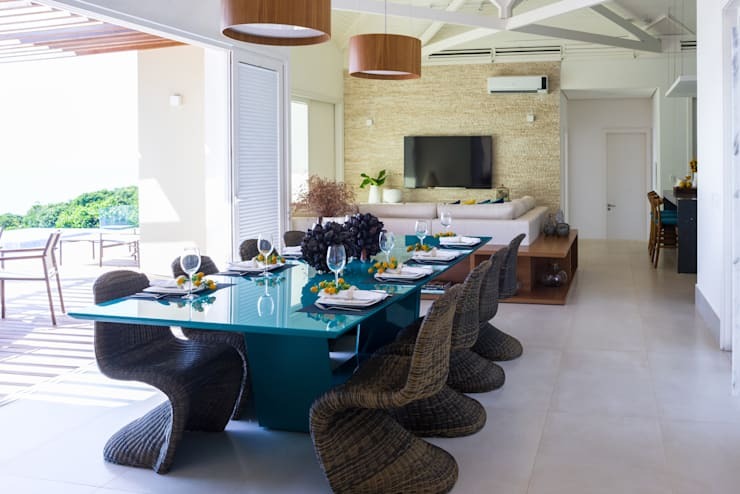 Wooden dining table tops have an unusual knack of finding itself at home everywhere, whether your home boasts of a rustic or contemporary décor. If you invest in a fine walnut or cherry wood dining table it will remain a part of your family for a very long time and would fetch good value when you or your descendants decide to sell it off. A wood table top, even those made of modern engineered wood, can be left exposed only with suitable table runners and mats for it has its own beauty. Increasingly, synthetic dining tables are becoming popular. These are lightweight, reasonably durable and pocket friendly. Some of these are also made to resemble more organic materials like teak. 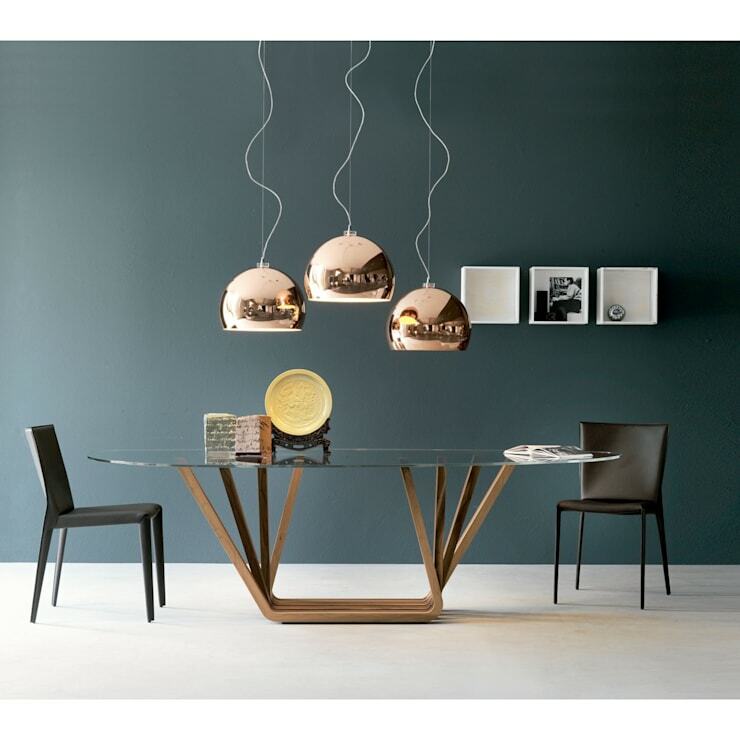 High end moulded dining tables look perfect in a contemporary set up. They come in a number of shapes and sizes. But, unless designed by famous designers or iconic brands, these hardly have a resale value. Once the novelty wears off, they tend to look stale. Conventional table décor looks a misfit with these kinds of tables and they look terrible in a traditionally decorated home. Marble was once the chosen table top for luxuriously decorated dining rooms. It is still used in many parts of the world where traditional décor is still considered highly appreciable. Granite and onyx table tops are also favoured by many. However, high quality marble and granite both are expensive. They are heavy and are not ideally suited for small homes and large dining tables. There is not much flexibility available in terms of shape. Faux marble top tables are also available but they do not look nearly as good as the real ones. Though it may sound strange, but proper table stands also matter a great deal. For transparent glass top tables, attractive stands add another layer of beauty. Heavier table tops like those made of marble or granite need to be complement with appropriate stands both for support and looks. Moulded tables too come with a variety of stands that can instantly enhance the charm of your dining room by their ingenuous designs. This is another aspect of a dining table that is often ignored. Coating your wooden table with an extra layer of paint is often discouraged. But if you are choosing synthetic tops then you can easily buy one that suits the overall colour scheme of your dining area. This will automatically brighten up the space in most unusual way. 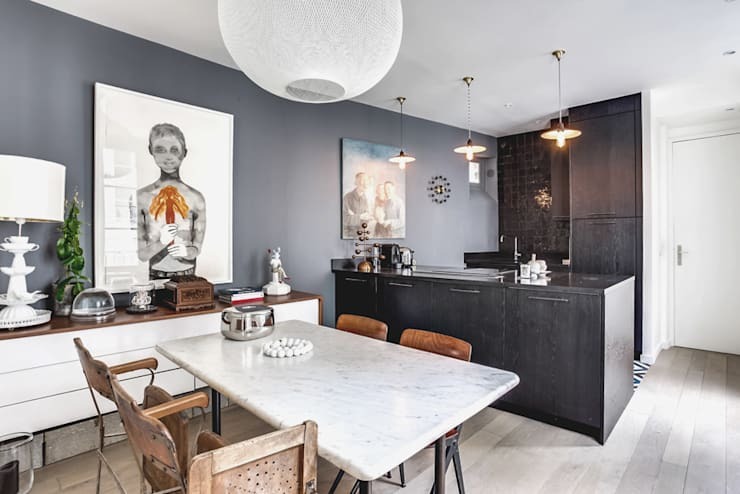 Be adventurous if you can and if your dining space can handle it, but make sure it is a colour that you will like to have in your home for some years. It is unlikely that, unless necessary, you will change your table top every year. So going by the trend of the season may not be a good idea for the long haul. 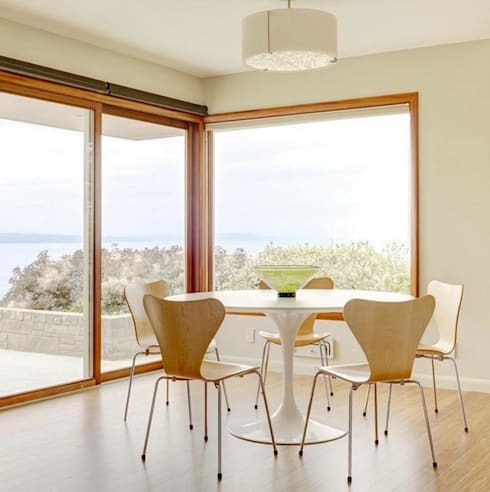 To know some more tips and tricks of dressing up your dining room read this.